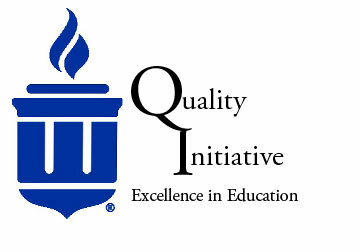 Embracing the Higher Learning Commission’s requirement to engage in continuous improvement, Washburn University is involved in a major quality initiative process related to educational excellence. The Washburn community has a vested interest and commitment to excellence, so faculty and staff from all aspects of Washburn University and Washburn Institute of Technology are encouraged to consider and share their ideas to address problems or opportunities related to excellence in education. Ideas are invited through a multi-phased proposal submission process starting with a very brief initial proposal. After review of the initial proposals, some applicants will be invited to submit a more comprehensive proposal. The University is particularly interested in proposals that are innovative and have broad impact. The University will commit funding in the range of $150,000 to $300,000 over a three year period to the selected proposal. When students first become a part of our Washburn environment, they are confronted by a number of changes presenting obstacles to effective learning. Perhaps for the first time they confront issues relating to study habits, time management, financial management, a diverse population of learners; all of which can be significantly different than when they were living at home with various levels of support or insights into these topics. Proposals in this area would address how Washburn can prepare and support students to effectively deal with these changes. Current discussions and initiatives in this area relate to first-year experience course elements, financial literacy, employment opportunities and work schedules, and all forms of social networking to name but a few. Many faculty members come to Washburn having taught for several years. For others, the Washburn teaching position may be their first educational experience in front of a classroom. The former group may be interested in modifying their traditional mode of teaching while the latter may seek basic tools of effective pedagogy. Regardless, best practices exist pertaining to many elements such as preparation of materials, the communication of ideas in a classroom setting, establishing learning goals, assessment of student learning, use of research and scholarly materials to reflect current learning, incorporating high impact practices, and leveraging community partnerships. Proposals in this area might focus on how to develop and sustain effective classroom teaching habits, facilitate ways of exchanging effective pedagogies (e.g.using internal Washburn experts), support recurring workshops where external experts present ideas, develop video materials, and assess prior learning effectively. The purpose of initiatives in this area will be to address three aspects of technology pertaining to learning. The first relates to elements of technology used in the delivery of educational components, such as increasing Washburn faculty members' and students' awareness of and comfort in using classroom hardware and software (e.g., PowerPoint, net-based video segments, the Cloud, projectors, computers, discussion rooms, open source material) for face-to-face, hybrid, and on-line instruction. The second relates to providing access to recent, common elements of technology found in various professions (e.g., health-related equipment, training machines, diagnostic testing equipment) so that faculty and students are fully prepared to enter work environments which require sophisticated use of technology. The third area deals with the concept of information literacy and effectively teaching students, and access information through various forms of sophisticated technology. This will require consistent updating for our instructors.